Fancy dress (costumes), street parties, parades, and a whole lot of German pride. That’s the cleanest way to sum up the weekend of Karneval Kraze in Cologne, Germany. For an entire week, the city basically shuts down and becomes a twilight zone during what is known as Germany’s “fifth season”. With the older crowd partying the day away, the night becomes young and the party never dies in this vibrant city of celebration. With myself as FaceBook Queen with the alter ego ‘Kuhh Ristin’ and Izybela as THE Miss America (along with Hong Kong-a-liciois Liza close to our heart) on night 1 and then representing as German flags on night 2, we didn’t exactly know what to expect. But us two spontaneous gals were ready to take Karneval by storm. Just like Mardi Gras in New Orleans, Carnival is a week of street parties and festivities leading up to Ash Wednesday and the 40 days of Lent. Basically, it is a time for all the Catholics to get the crazies out of their system before it’s time to repent. Overall, it’s just a good time. Celebrated differently throughout the world, Cologne holds the title of Europe’s Carnival Capital. The “crazy days” begin on Thursday with Women’s Carnival Day where ladies can run around with scissors and cut off the ties of men dumb enough to wear them on this estrogen driven day. Friday and Saturday are the big party days. You’ll find hoopla around every corner with parades of costumed people singing, dancing, and drumming through the streets while cheering “Kölle Alaaf” (Cologne above all). Carnival Sunday is a day of parades with school groups and clubs dressed in original costumes. Don’t forget to bring a bag…Halloween comes early with candy thrown at you in all directions. On Rose Monday the city shuts down for the climax event of Carnival, the official parade. Dazzling floats and crowds of fancy dressed spectators take over the streets at this highlight event. And finally, gluttony rules all on Pancake Day, Cologne’s Mardi Gras or Fat Tuesday. 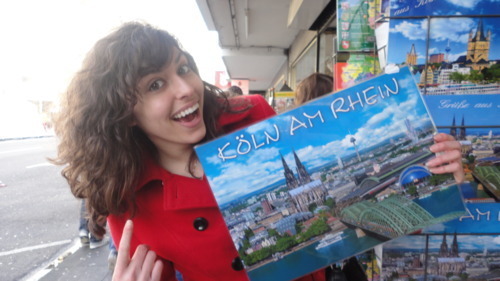 Equally exciting, being the dork that I am I made a visit to my last name—‘am Rhein’ translates to “at the Rhein”, the longest river in Germany. 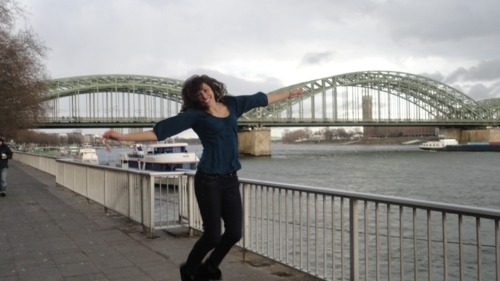 So I was literally ‘Kristin AmRhein’ as I did my classic HSM pic alongside the river with pseudo snowfall landing in my hair and in good company with a one-of-a- kind friend. Needless to say, it was one of the happiest moments of my life. Karneval was the perfect girls weekend away from reality and it’s a top European experience for the books. But it’s not one that can be described in writing. Like many life events, until you have personally experienced something yourself you don’t truly appreciate or understand it. What is the lure, the desire, the need for more in every regard? For me it’s the crave to make the most out of life and soak up every moment in the moment. Karneval weekend was exactly that.